Arguably one of the most popular horror sequels ever made, The Bride of Frankenstein has been cited as James Whale’s masterpiece, Boris Karloff’s finest hour, and the crown jewel of Universal’s monster series. Here’s what every movie buff should know about the 1935 classic. 1. AT FIRST, JAMES WHALE DIDN’T WANT TO DO THE MOVIE. In 1931, Universal released what’s often viewed as the definitive film adaptation of Mary Shelley’s Frankenstein. Directed by James Whale and starring Boris Karloff in a breakout performance, the movie was a colossal success. Critics at The New York Times praised it as one of the year’s greatest films. At the box office, Frankenstein exceeded all expectations—grossing an astounding $12 million against a $262,000 budget. Naturally, Universal wasted no time in planning a sequel. Before 1931 came to a close, Robert Florey—who’d later write a short story that would become Universal's The Wolf Man—submitted a seven-page story outline for a follow-up movie called The New Adventures of Frankenstein: The Monster Lives. Although Florey’s ideas were flatly dismissed, Universal was determined to churn out a second film. For his part, Whale believed that he was done with the franchise. “I squeezed the idea dry with the original picture and never want to work on it again,” he told a friend. Eventually, though, the auteur agreed to direct The Bride of Frankenstein on the condition that he be given a greater degree of creative control this time around. The studio agreed. 2. REJECTED PLOT CONCEPTS INVOLVED EVERYTHING FROM DEATH-RAYS TO CIRCUS LIONS. During pre-production, numerous story outlines were entertained. One scriptwriter came up with a bizarre plot in which Dr. and Mrs. Frankenstein change their names and go into hiding as circus performers. When the monster finds them, he angrily petitions the doctor for a mate, but ends up getting eaten by some trained lions instead. Another idea called for Dr. Frankenstein to murder his own creation with a death-ray—at the League of Nations headquarters, no less! 3. ERNEST THESIGER BEAT OUT TWO HORROR LEGENDS FOR THE ROLE OF DR. PRETORIUS. The true villain in The Bride of Frankenstein isn’t the monster, nor is it his would-be wife or Dr. Henry Frankenstein himself. Rather, it’s another crazed scientist who goes by the name of Dr. Pretorius. Universal A-listers Claude Rains and Bela Lugosi were both considered for the role. But in the end, Whale cast Ernest Thesiger, a brilliant character actor who’d previously worked with the director on such films as The Old Dark House (1932) and The Ghoul (1933). 4. LOOK CLOSELY AND YOU’LL NOTICE THAT THE MONSTER’S WOUNDS APPEAR TO HEAL. In the original Frankenstein’s thrilling climax, the monster seems to meet its demise inside of a windmill that’s caught fire. So when we first see the creature in Bride, the big brute is riddled with obvious burns. Also, a lot of his hair has obviously been singed off. For subsequent scenes, however, makeup artist Jack Pierce incrementally toned down the burns and replaced some of the hair. This created the illusion that the monster was slowly recovering from its injuries over the course of the film. 5. PRETORIUS’S MINIATURE MERMAID WAS AN OLYMPIC MEDALIST. While trying to enlist Henry’s aid, the twisted doctor shows off some of his own creations—namely, a quintet of tiny people that are kept in glass bottles. There’s a miniature queen; a gluttonous king, clearly modeled after Henry VIII; a ballerina; a drowsy archbishop; and even a bearded figure whom Pretorius introduces as “the very devil” himself. Finally, he unveils a Lilliputian mermaid, as portrayed by Josephine McKim. In real life, McKim was an accomplished swimmer who competed at the 1928 and 1932 Olympics. Overall, she won three medals for the U.S., including two golds. 6. BORIS KARLOFF OBJECTED TO GIVING THE MONSTER ANY DIALOGUE. 7. AT ONE POINT, THE BLIND MAN PLAYS “AVE MARIA” ON HIS VIOLIN. In a scene that Mel Brooks would lovingly spoof almost 40 years later, the monster befriends a sage-like violinist who lives alone in the woods and happens to be blind. Classical music fans will no doubt recognize the tune that the character is playing when Karloff’s creature first makes his acquaintance. The melody comes from “Ave Maria,” a famous prayer composed by Franz Schubert in 1825. Later on, when the monster and his only friend tearfully join hands, the theme can again be heard in the background. 8. MARILYN HARRIS (THE “DROWNED GIRL” FROM THE FIRST MOVIE) MAKES A BRIEF APPEARANCE. Marilyn Harris’s character in the original Frankenstein was a little girl with a tragically short lifespan. In that film, the sweet-tempered child invited the monster to play with her by a lakeside. Failing to predict the consequences of his actions, the creature unintentionally killed his new pal by tossing her into the water. Universal horror fans hadn’t seen the last of Harris, however. As The Bride of Frankenstein DVD commentary points out, she briefly shows up in the sequel. Forty-five minutes in, the actress can be seen leading a group of rural school kids who run away in terror when the monster approaches. 9. THE BRIDE’S FAMOUS HAIRDO WAS SUPPORTED BY A WIRE CAGE. Elsa Lanchester was double-cast in this movie. During the prologue, she portrays a young Mary Shelley. Then, toward the climax, she makes an electrifying entrance as the intended bride of Frankenstein’s monster. Perhaps the most striking aspect of the creature is her wild, streaky coiffure. The look—which was inspired by the Egyptian queen Nefertiti—has become every bit as iconic as the widow’s peak that Bela Lugosi so confidently rocked as Count Dracula. Over the years, it’s been duplicated in several horror-comedies, from The Rocky Horror Picture Show to Hotel Transylvania. Lanchester’s unusual ‘do wasn’t a wig, by the way—her actual hair was used to create the look. “I had it lifted up from my face, all the way around; then they placed a cage on my head and combed my own hair over that cage. Then they put the gray-streak hairpieces in afterwards,” she explained in an interview. 10. THE BRIDE’S VOCALIZATIONS WERE PARTLY INSPIRED BY SOME ANGRY BIRDS. 11. PART OF THE ENDING WAS HASTILY RE-SHOT. Originally, Henry Frankenstein (played by Colin Clive) was going to die in the climactic explosion along with the monster, its hissing mate, and Pretorius. However, after the sequence had already been filmed, Universal insisted that Whale go back and change it. Feeling that Bride should end on a somewhat happy note, the studio wanted Henry to survive the blast, and Whale grudgingly agreed. Just a few days before the movie opened on April 22, 1935, some additional shots of Henry and his wife, Elizabeth, dashing away from the castle were filmed. This created a blooper in the final cut: If you pause the above clip at 2:15, you can clearly see Henry hugging the inside wall—after he’s already left the premises—just a few seconds before the whole building collapses. 12. THE MOVIE WAS BANNED IN MULTIPLE COUNTRIES. 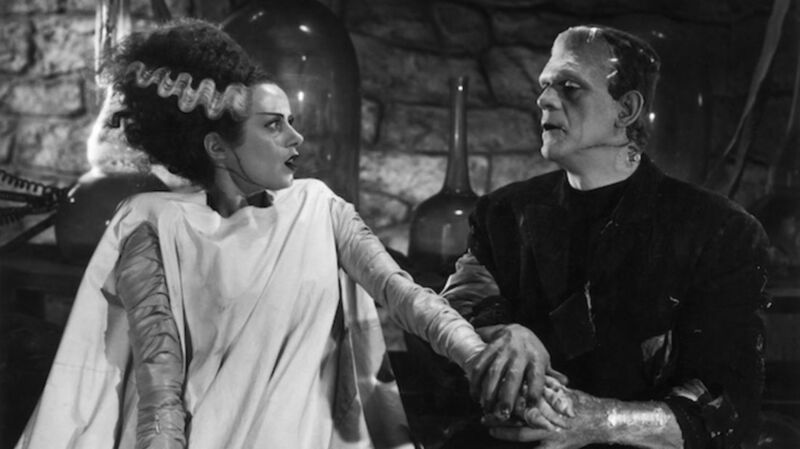 With its high body count, religious imagery, and sexual undertones, The Bride of Frankenstein did not endear itself to certain viewers—or to certain governments, for that matter. The film was banned outright in Trinidad, Hungary, and Palestine. In China, censors insisted that four key scenes be cut from the movie before it could be legally shown within the country’s borders. Not to be outdone, the Swedish censorship board implemented a staggering 25 cuts, dramatically reducing Bride’s runtime. 13. THIS WAS THE ONLY ENTRY IN UNIVERSAL’S FRANKENSTEIN SERIES TO RECEIVE AN OSCAR NOD. The Bride of Frankenstein received an Academy Award nomination for Best Sound Recording, although it lost the award to Naughty Marietta, an MGM movie musical starring Jeanette MacDonald and Nelson Eddy. 14. IT’S NEIL GAIMAN’S FAVORITE HORROR MOVIE. “It’s a lot of people’s favorite horror film," said bestselling author Neil Gaiman of The Bride of Frankenstein. "Dammit, it’s my favorite horror film.” In the above clip, Gaiman recalls staying up late as a boy to catch both Frankenstein and its 1935 sequel in a televised double-feature. What did he think? “Frankenstein was a huge disappointment to me,” Gaiman admitted, but he fell in love with the atmospheric Bride and remains a fan to this day. He is especially fond of the climax, which he cites as his favorite “two to three minutes of film, ever.” Another celebrity admirer is Guillermo del Toro, who, in a 2008 conversation with Rotten Tomatoes, ranked The Bride of Frankenstein as one of his top five films.